When batting, you get very little information, just swing your bat when the ball comes, and you should do fine. A little bit of personal information for you, when there was a period of downtime to this site, there were two reasons. The first was due to the fact my computer expoded quite specacularly, losing a bunch of my articles, and it took me a while to regain my love for writing it all again. The second was due to me being on holiday. I headed to the United States for a week, and immediately fell in love with baseball. 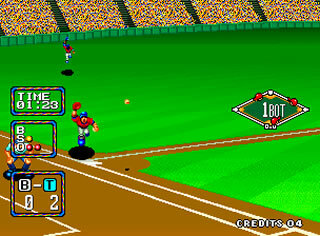 On my return, I scoured the retro scene to find the best baseball game out there. I settled on one – Baseball Stars 2. Unlike the American game, this features a true “World Series”, with teams from all over the world, with only one team in each league from the USA. Apart from this, the game – for an arcade game especially – follows the sport of baseball actually very closely, with base steals, pinch hitters and batting averages all featuring prominently. 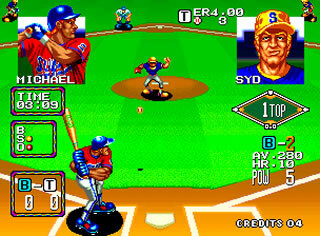 In fact, the only addition to give it an arcade feel are “Power Bats”, bats that in the right hands guarentee a home run. Apart from that, it’s follows the sport pretty closely. Baseball is an American game, and for us outside of the States – unless you have actually been to a baseball game – you probably don’t understand the rules or what the fuss is about. Baseball does take forever to get going, and there is often hardly any score. So how can this game appeal to non fans? When a hit is good, the game switches to a fielding screen, where it is easy to control the fielders. Well, three things the game does to help get us interested in the sport. The first is the stats, or lack thereof. You simply have a batting average and a bowling average, that’s it. Give your power bats to your big hitters, and give your rubbish pitchers weak players to pitch against, and you should be laughing. The second is the presentation of the game is upto the top notch standard we have come to expect from SNK games. The graphics are bright and bold, and the presentation is spotless, the commentary isn’t upto much, but it’ll do. The only thing that lets it down is the music, which is rather forgettable. Finally, the game excels because it’s quick. If you watch real baseball, pitches can take forever, in this game you have a strict time limit, and you are encouraged to get the game over as quickly as possible. It will never convert the pure haters, but for those with more than a passing interest in the sport, you can do no worse than playing this. It’s probably the most popular baseball game out there for the “Rest of the World” crowd, and well worth adding to your collection.